Mayor Sly James talks with Dawn Lindsey, who says she would be stuck with $500,000 in medical bills without health insurance from the Affordable Care Act. 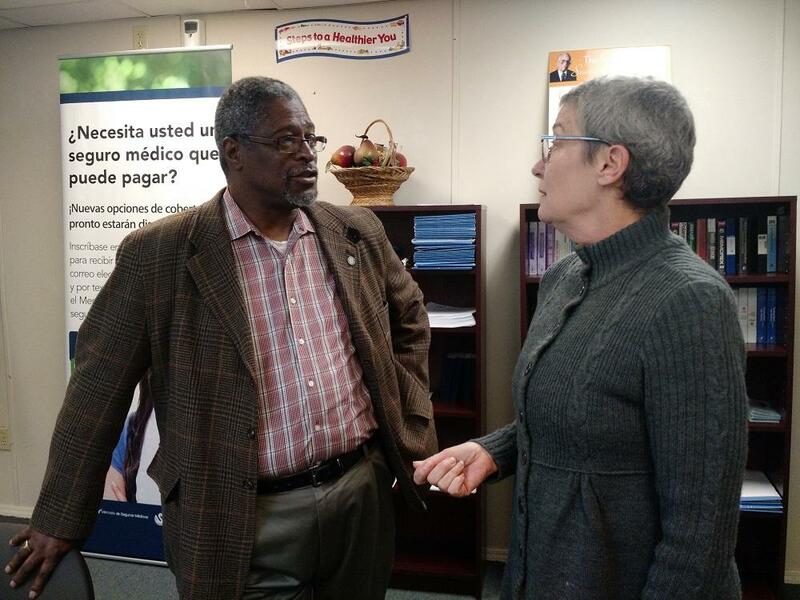 Kansas City Mayor Sly James met with health care counselors and members of the public at Samuel Rodgers Health Center Saturday to promote enrollment on the Affordable Care Act marketplace. In November, the White House announced Kansas City would be part of its "Healthy Communities Challenge," which tasked 20 cities with signing as many uninsured citizens up for health care as possible before open enrollment closes. In the Kansas City area, around 112,000 people who are eligible for health care coverage currently don't have insurance. James said one big hurdle in the way of signing those residents up for coverage is a lack of ready access to both traditional and digital media. "Those of us who are connected to the Internet, we're going to look [for information] there, those of watch a lot of TV, listen to radio, read the paper, we're going to look there," James said. "It would be best if we could identify each individual person who we know is uninsured and have face-to-face contact with them." Samuel Rodgers health counselor Jim Torres says the non profit helped at least 200 Kansas Citians sign up for health coverage through the Affordable Care Act marketplace in November, and they expect to have similar numbers of enrollees in December and January. "People who land between 100 and 300 percent of the federal poverty level should qualify for financial help or subsidies to make health care affordable," Torres said. "A lot of the people we see have health problems and they've got bills. They need insurance to have access to doctors." Dawn Lindsey signed up for health care through the federal exchange two years ago, but didn't immediately use the coverage. But a year later, she was diagnosed with stage 3 uterine cancer. She's now in remission and says her medical bills would've been crushing had she not gotten insured. "My bills have been $500,000," Lindsey said. "People think there are ways around that, but there really aren't. I couldn't have paid that off in my entire lifetime." The Affordable Care Act's third open enrollment period ends on Jan. 31, 2016. Residents have until Dec. 15 to sign up for coverage that begins on Jan. 1. Those who qualify for a health insurance plan through the Affordable Care Act but do not sign up will be penalized under the law. Kansas City residents who are interested in health coverage can sign themselves up through the exchange website or call 211 for referral through United Way. Cody Newill is a reporter for KCUR. You can reach him on Twitter @CodyNewill or send him an email at cody@kcur.org. The number of Kansans maintaining health coverage through healthcare.gov, the federal online marketplace, has declined since spring. As of the end of June, 84,872 Kansans were enrolled in Affordable Care Act policies, according to the U.S. Department of Health and Human Services. That’s down 0.7 percent from the nearly 85,490 enrolled at the end of March but higher than the 57,000 enrolled in the spring of 2014. In Missouri, enrollment decreased to 212,256 in June from 219,953 in March, a decline of 3.5 percent. Editor's note: This is the first of two stories looking at Medicaid expansion in Missouri and Kansas. Today's story looks at the failure to expand Medicaid in Missouri. Tomorrow's story will look at the failure to expand Medicaid in Kansas. On Thursday at 7:25 p.m., KCPT Channel 19 will air a video tied to the stories. It’s a sweltering Monday afternoon, and in the emergency room of Truman Medical Centers near downtown Kansas City, a patient complains of excruciating abdominal pain. 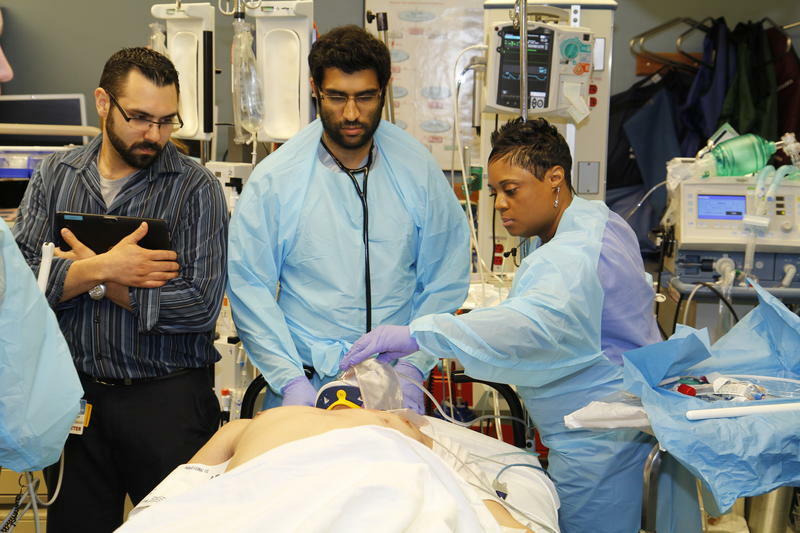 The attending physician advises her there’s only so much he can do. Add the Wichita Metro Chamber of Commerce to the list of Kansas organizations that support expanding Medicaid to cover more low-income adults. Pushed by influential hospital members Via Christi Health and Wesley Medical Center, the chamber’s board voted Thursday to add expansion to its list of policy priorities for the 2016 legislative session, said Jason Watkins, the organization’s lobbyist.